Just wanna share this birthday party with you all, and to my N@wie friends, though this is only my nephew's party, ako naman nag plan and execute lahat so might as well share na rin..and sorry because this was last August of 2007 pa. This is one low budget party lang pero it turned out so nice at super enjoy ang mga kids. Invites : I asked a former officemate to do the lay-out, just gave him the picture and the wordings, bought photo paper sa CDR king then ako na nagprint. Ok naman venue, suki na sis ko ditto because it’s very near in their place. Small venue lang,can accommodate yata up to 100 or less. The cost..very mimimal lang. if I remember it right pag aircon, 600 per hour, pag non-aircon, 300 per hour. And free pa ang chairs and tables ha. 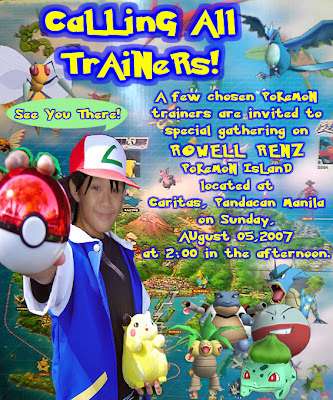 Entrance décor : Welcome to renz Pokemon Island..idea ko pero si hubby ang nag execute. Backdrop : Made by my hubby too, good thing he has talent sa styro craft. medyo di lang pantay ang pagkalagay. Gift ko ito sa kanya and he really liked it, specially si “Balbasaur” ang topping..favorite nya kasi yan and the minicupcakes..super natuwa talaga ang mga kids. Giveaway/lootbags for the kids-DIY. I searched and searched over the internet and was able to find this printable DIY lootbag from this site. I made 80 pieces yata, I printed different pokemon characters and ask my nephew to color them,very personalized kasi the birthday boy ang namili ng characters and he worked on it talaga. Contents : pokemon cards, pokemon toys, pokemon button pin and pokemon small book. Me and hubby also made the Pikachu hats and all the other styro decor. Medyo mahaba-haba lang na preparation because halos DIY lahat but it's always worth it.Next time, I know I would do it again and siempre this time mas maganda na because I know some DIY Balloon decor na. Thanks sa internet.